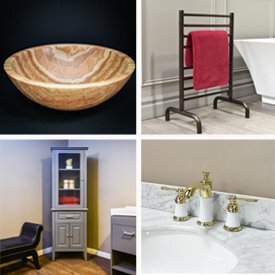 Based in Orange County, Southern California, Luxury Living Direct has been providing bathroom vanities to homeowners since 2009. The store originally started in OC, carrying a full assortment of bathroom fixtures including showers, range hoods, bathtubs, vanities and more. Since then, our store has been more selective on the products we carry in order to ensure the best experience for our customers. We ship anywhere from Los Angeles, to anywhere in the United States, excluding Alaska and Hawaii. Being one of Virtu USA’s earliest retailers, we have have developed a relationship in order to provide some of the best prices and services. Our assortment includes different styles, colors and sizes of high quality vanities that are fit for virtually any home design. Having been in the industry for a while, we have been able to develop strong relationships with many contractors and builders. With our ability to provide wholesale bathroom vanity prices on 2 or more items, we offer strong prices for multiple item orders for contractors, builders as well as homeowners with more than one bathroom. We understand that communication with our customers is important. It is even more important when there are deadlines to be met with home remodel projects. We have made measures to improve communication lines to our customers to let them know the status of their shipment and continue to improve this crucial element. If you are unable to get the status of your shipment, give us a call at +1(800)574-3022 and we will answer any questions you have. Nice to find a dependable online. . .